It was January 2015 when I was sitting on my couch stressed, depressed, and unemployed. I had just been laid off from my job at a head shop. But this wasn't just some job, at some rando headshop. It was the business I started, poured my heart and soul into then sold. It's a long story but it seemed like a good deal when I agreed to sell my business. I was supposed to remain employed there and help manage it.. well a lot of things were supposed to happen but sometimes things don't turn out as planned. I couldn't go back to being employed as a social worker and my future was a big fat question mark.. To be truthful, I was an emotional wreck and was having a hard time coping so I dove into art and medicating with cannabis. I had always wanted to learn how to use Adobe Illustrator to create art and now seemed like a good time as any. I began playing around with simple line work and decided my first project would be a cannabis themed coloring book. Here's the artwork for my first copy of CMC, it was only available for download on Etsy and consisted of 10 very, very simple coloring pages. You'll notice on the cover it says by "All Seeing High" and has "ASH" as a watermark, I hadn't even created the handle "Chronic Crafter" yet. I was only on the web as All Seeing High, my place to share cannabis focused information, product reviews, and a way for me to connect with other stoners.. which I had already been doing for a year or so. It took forever for me to finish those 10 first coloring pages, since I bascially had no idea what I was doing. But as soon as I uploaded this digital download coloring book to Etsy I started on another 10 pages. Because practice makes perfect and I knew my artwork could look better and more detailed since I was finally sorta getting the hang of using Adobe Illustrator. It was also around this time I learned about a wonderful service that Amazon.com provides called "Create Space" it's a way for independent writers to get published and have their books printed by Amazon then sold on their website. My imagination ran wild, as I dreamed of selling my coloring book through Amazon, having them print and sell the copies then I receive a check in the mail. When I told my Mom my dream she would say I'm lazy. I would say I'm into working smarter, not harder. Through this dream, the Chronic Crafter was born! Here's my first copy of Color Me Cannabis that was available on Amazon. Color Me Cannabis was released in November of 2015 and I sold over 30 in a month. Needless to say, I was pretty freaking excited!! I also wanted to share my love of crafting and the cannabis plant with others so I started up a blog, Youtube Channel and went to work on creating another 20 pages for Color Me Cannabis. If you want a highly enjoyable activity then grab a digital copy of CMC on Etsy here or grab a physical copy off Amazon here. 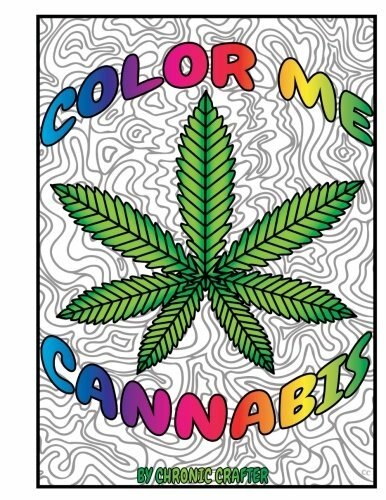 If you're not sure if coloring is for you, how about you download a page from Color Me Cannabis for FREE and give it a try? Thanks for reading this blog, I hope you enjoyed the story of how Chronic Crafter and Color Me Cannabis came to be!